The Typhoon 28" Multiple Hose Hookah is a smaller version of The Cyclone, standing at the ideal height for the ultimate Hookah smoker. The Typhoon is world renowned for its design, and functionality. The Typhoon is another Hookah that is found mostly in Hookah Lounges across the country. 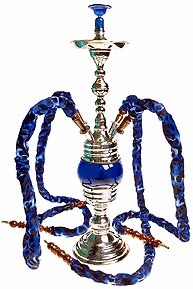 This Hookah was hand crafted in the heart of Egypt, being made out of a high quality Stainless Steel material. The Typhoon rotates a full 360 degrees to allow for durability, as well as flexibility with the individual Hookah smoker. The Typhoon contains a round crystal ball glass, allowing the Hookah to retain and release more smoke, allowing for a smooth, fresh, and more enjoyable smoking experience. This Hookah may be used for both decorative and smoking pleasures, providing entertainment for years to come. 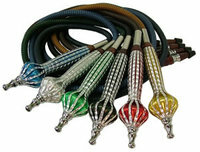 The Typhoon Hookah comes in One, Three, and Four Hose models to accommodate the ultimate Hookah smoker.